Quebec and BC’s pension funds have land investments in Brazil that are forcing peasants off their land through violence and fraud. Inter Pares and other Canadian organizations have conducted research that shows that some of this land has been acquired from a person accused of forcibly displacing local people, and even assassinating one farmer who refused to sell, and through falsifying documentation to claim ownership. The fund is also evading local laws that were designed prevent speculation that drives farmers off their land. As part of the campaign "My Retirement, Not at the Price of Human Dignity! ", Inter Pares is encouraging people to write to the CEOs of the pension funds to express their indignation. Both pension funds have made a commitment to invest in businesses that respect human rights as well as Canadian and international standards for environmental regulations. Hold these funds accountable. Canada dominates the global mining industry, with active projects in 100 countries. The budgets of these companies are often bigger than the budgets of the countries in which they mine. Yet there are virtually no regulations in Canada to prevent unscrupulous companies from taking advantage of weak environmental and labour laws, lax oversight of health and safety regulations, or lack of protection for human rights and the rights of indigenous peoples. Canada can do its part. Work with us to make Canada Open for Justice! Up for Debate: Are our party leaders Up for Debate? Over 175 women's organizations - including Inter Pares - sought to create a national conversation on gender equality and women's rights for the 2015 federal election. Thirty years have passed since Canada held its first and only leaders' debate on issues identified by women during a federal election. Much has changed since that time - yet women in Canada are still grappling with many of the same problems, and inequality remains. 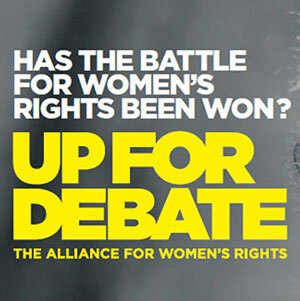 The Up for Debate campaign called on Canadian federal political parties to make meaningful commitments to change women's lives for the better, at home and around the world. The Canadian Council for International Cooperation, of which Inter Pares is a member, called for greater leadership from Canada in tackling global issues in 2015, and specific action on inequality, climate change and women's rights. Canada can and must provide stronger leadership toward a more sustainable & peaceful world. Their election toolkit help you put the We Can Do Better campaign issues on the political agenda. Does food matter to you? Recent public opinion data shows that food is one of the most important issues for voters. 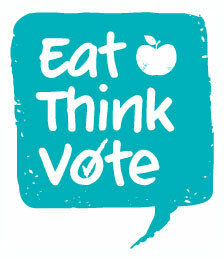 The "Eat Think Vote" campaign aimed to make sure food matters to our politicians. Food Secure Canada and its partners - including Inter Pares - organized Eat Think Vote food events across the country to engage citizens and candidates in the 2015 federal election on making a national food policy a reality in Canada. Then and now, we are calling for the creation of a national food policy where no one goes hungry and all Canadians have access to healthy, just, and sustainable food. With the help of our supporters, Inter Pares strengthened the connection between movements for migrant workers' rights in Canada and in Guatemala. In October 2012, Inter Pares brought three activists working for justice for migrant workers for a learning and strategizing exchange to Canada. The three delegates came on a 16-day tour that visited 9 cities in Ontario, Quebec, and Alberta. Inter Pares continues to work, with its counterparts, on the issue of migration. Read more about this issue. In November 2011, Inter Pares organized a tour of public events inSaskatoon, Toronto, Montreal and Ottawa to explore how to build economic equality in our communities and around the world. Each event featured powerful presentations and thought-provoking discussions. Visit the economic justice section of our website to learn more about this issue. Enviropig: genetically modified pork on our dinner tables? In 2010, a new genetically engineered pig, called “Enviropig”, was developed at the University of Guelph in Ontario and was about to become the first GM food animal approved in the world. Thanks to actions taken by concerned citizens and organizations, including Inter Pares and our counterpart CBAN, the genetically modified pig project was shut down. Visit CBAN’s website to learn more about this campaign.